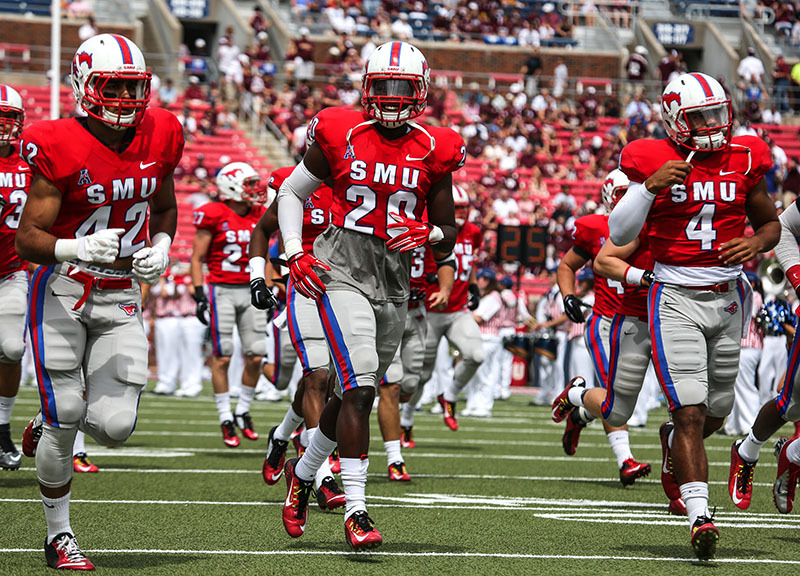 Scenes From SMU's Home Opening 58-6 Loss To Texas A&M At Ford Stadium. The Southern Methodist University football program's home opening 58-6 blowout loss to the sixth-ranked Texas A&M University Aggies didn't surprise anyone — not even Tom Mason, the Mustangs' interim head coach. No, Mason, who made his head coaching debut this past Saturday at Gerald J Ford. Stadium following former head coach June Jones' resignation on September 8 after an 0-2 start to the season, seemed to know exactly what was what with the program he's been charged with heading for the time being. 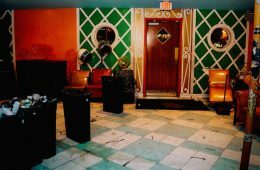 “I'm not sitting in the chair because we were a great football team,” Mason continued, in spite of the fact that Jones denied that the team's slow start was his reason for resigning. Still, SMU's schedule to date hasn't quite reflected the team's middling nature. Saturday's game against A&M was the second time in this young season in which SMU faced a Top 10 team in the country. 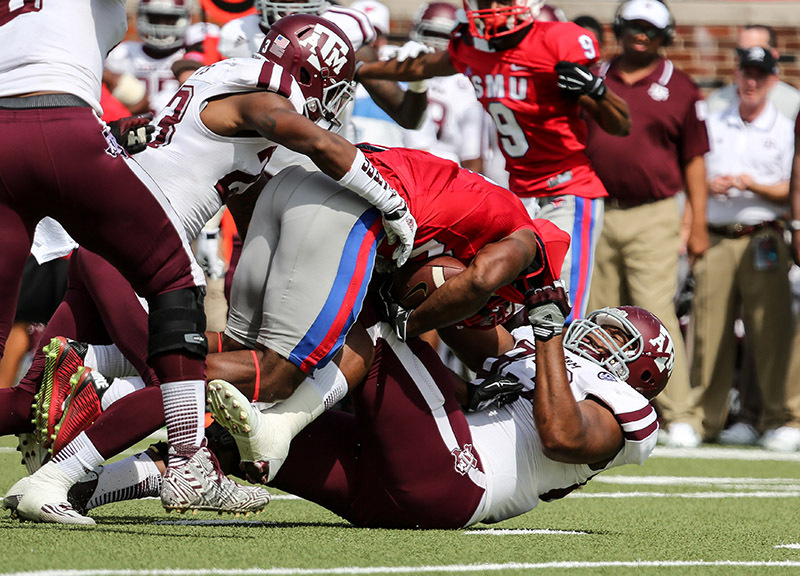 And it didn't start horribly: An aggressive start from the SMU defense held A&M to a field goal on its first drive and forced sophomore A&M quarterback Kenny Hill's first interception of the season. Unfortunately, the offense failed to provide any aid, starting off the game with two three-and-out drives. 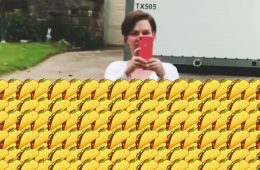 Then the onslaught really started as A&M would go on to score on its next seven drives. 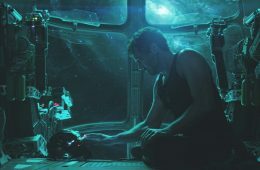 And, after throwing for 265 yards and two touchdowns as well as 57 yards rushing, Hill, a Heisman contender after a fast start to the season, sat the entire second half, having giving his team a 38-3 lead with which to play. SMU too featured multiple quarterbacks in this game. Redshirt freshman Kolney Cassel became the team's third quarterback to receive playing time this season by making his first career start against A&M, but he was benched in the second quarter after completing just one of five pass attempts for all of two yards. 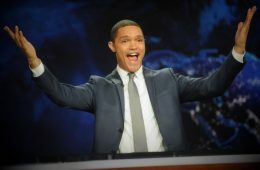 His replacement, junior Garrett Krstich, then became the team's fourth to earn action, and he actually provided some solid offensive production with 137 yards passing against A&M's second and third defenses, but couldn't bring his team out of the hole that had already been dug — something that he, too, lamented after the game. Despite being sacked five times, though, Krstich showcased an impressive toughness. When scrambling out of the pocket, he lowered his shoulder against A&M defenders on several occasions and wasn't afraid to throw the deep ball. He eventually connected with senior Der'rikk Thompson for 53 yards on one of those attempts. So there were some bright spots. 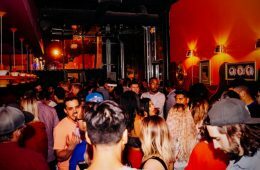 And players and coaches alike reaffirmed after the game that the season isn't a total loss just yet. 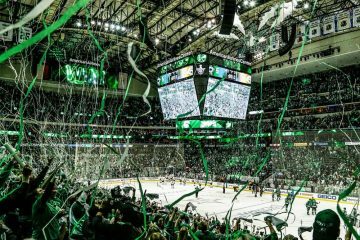 Mason even went so far as to contend that his team is steadily improving. Well, maybe a little. Especially given that there's still a big hurdle on the Mustangs' schedule before conference play begins in two weeks against East Carolina University. 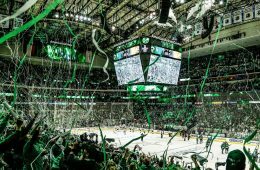 Next Saturday, SMU will welcome its perennially tough regional rival Texas Christian University to Gerald J. Ford Stadium. 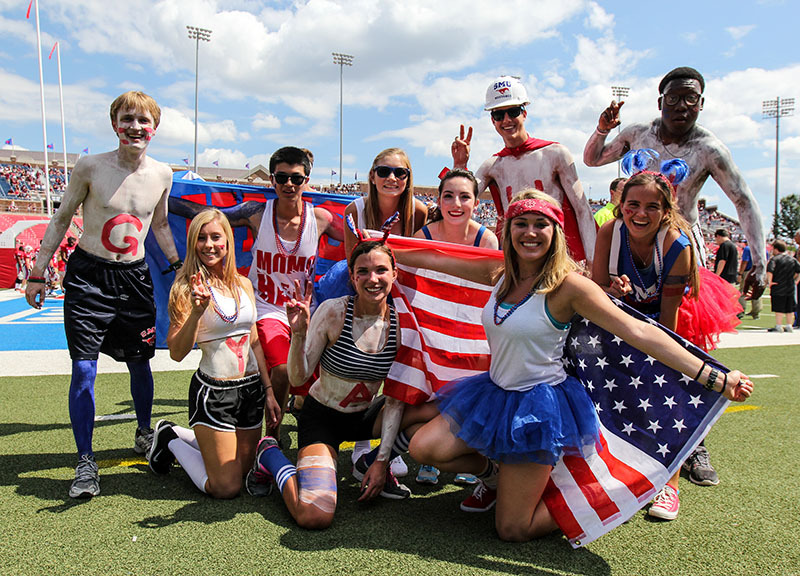 SMU fans pose for photos before the Mustangs' home opener against Texas A&M. 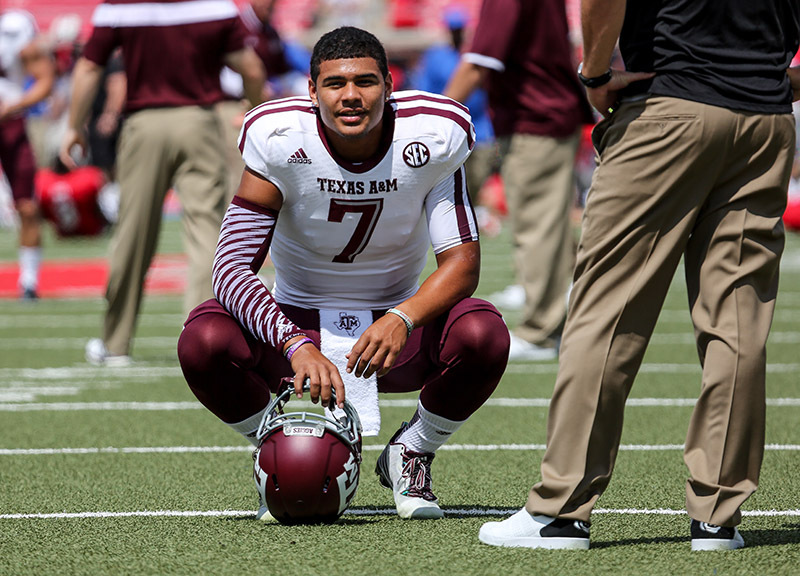 Texas A&M quarterback Kenny Hill (7) talks with coaches during pre-game warmups. Hill replaced former Aggie Johnny Manziel and has performed well enough to placed on Heisman watch lists. 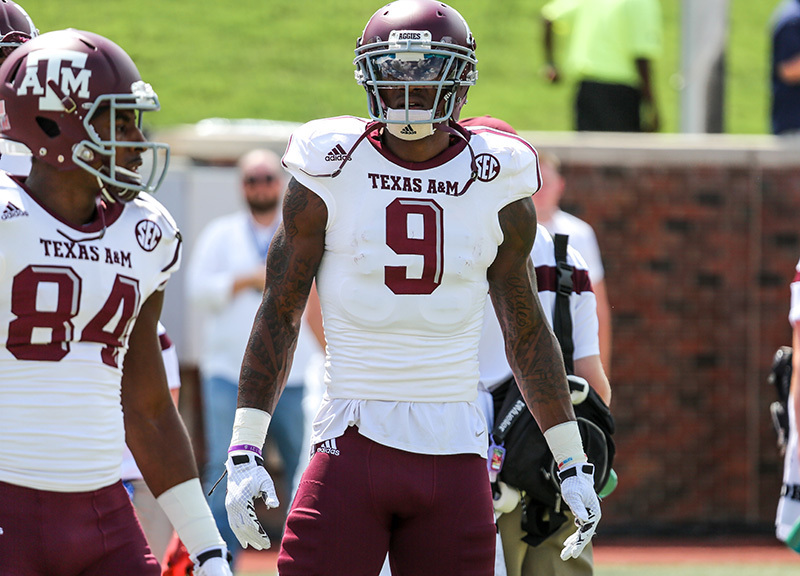 Texas A&M wide receiver Ricky Seals-Jones (9) waits for passes during pre-game warmups. Seals-Jones is poised for a breakout season during his redshirt freshman season after injuring his knee last season. SMU Mustangs run out on to the field during pre-game introductions. 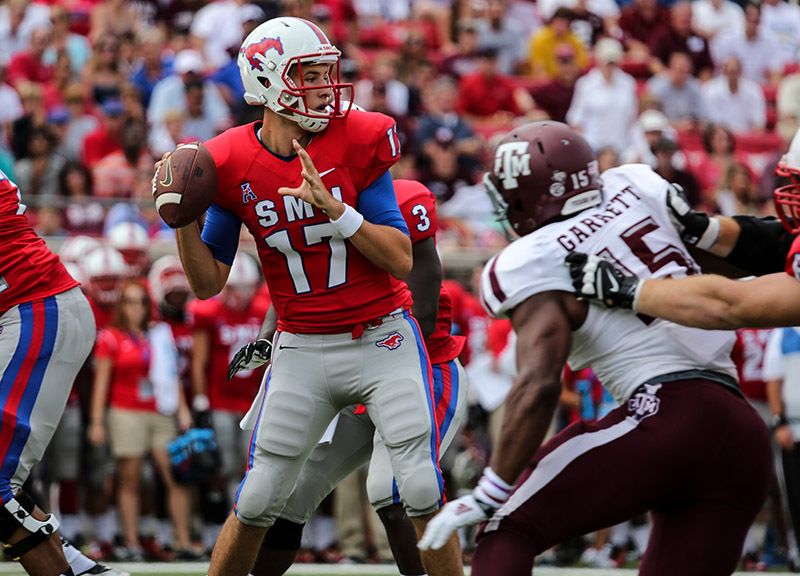 SMU quarterback Kolney Cassel (17) attempts to throw under pressure from A&M defensive end Myles Garrett (15). Garrett, a true freshman, is well on his way to breaking Jadeveon Clowney's SEC freshman sack-record. 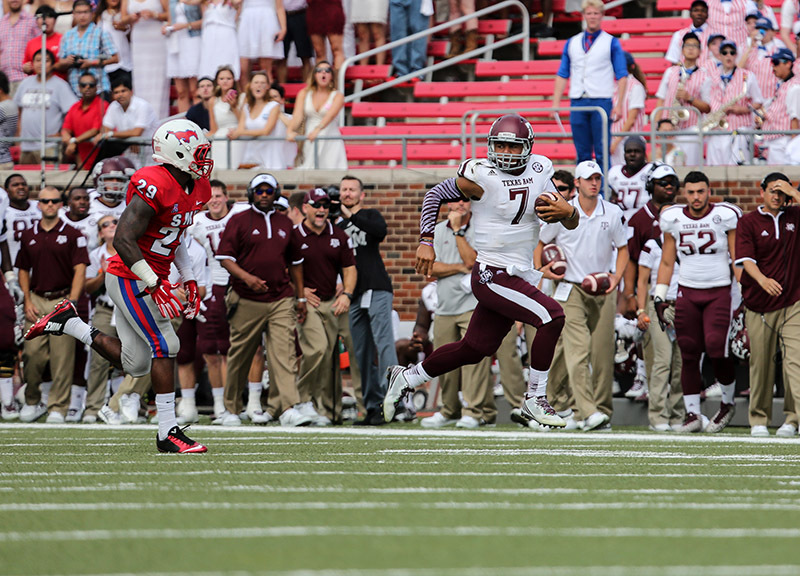 Texas A&M quarterback Kenny Hill (7) breaks away from the SMU defense for a 58 yard run. 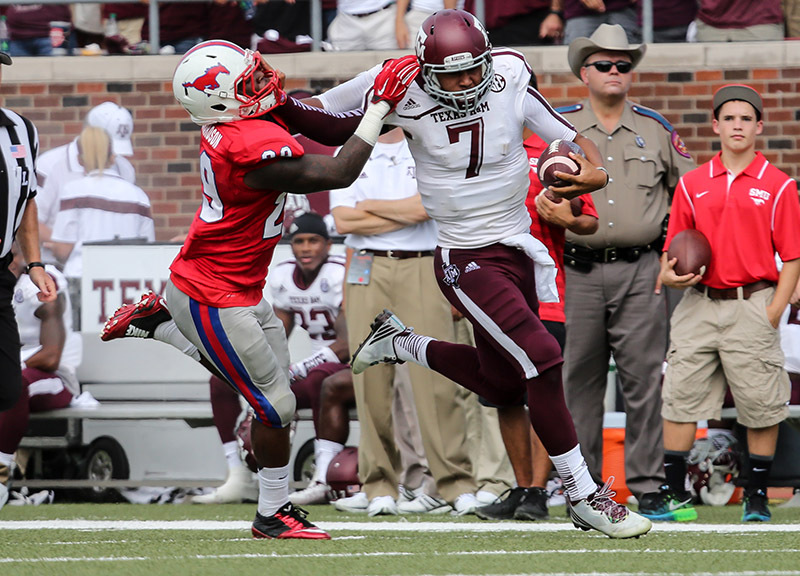 Texas A&M quarterback Kenny Hill (7) stiff-arms SMU defensive back Darrion Richardson (29). 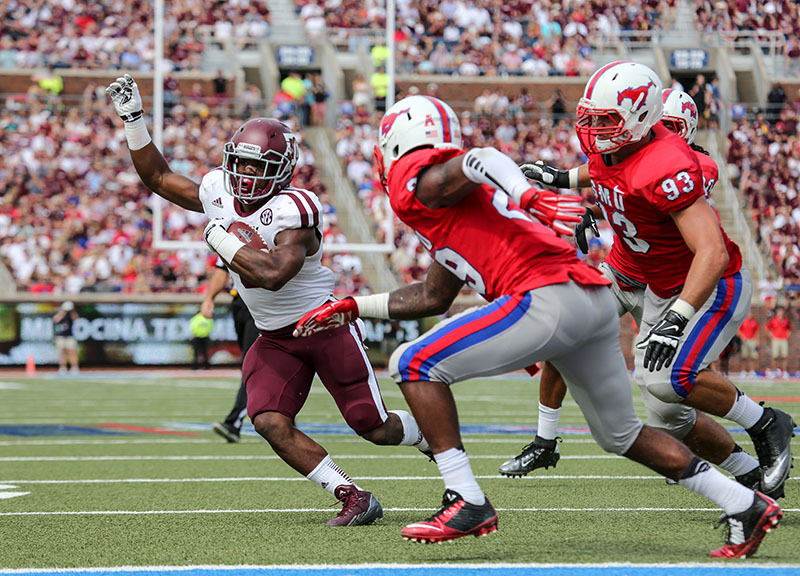 Texas A&M running back Trey Williams (3) runs through an attempted tackle by SMU linebacker John Bordano (46). 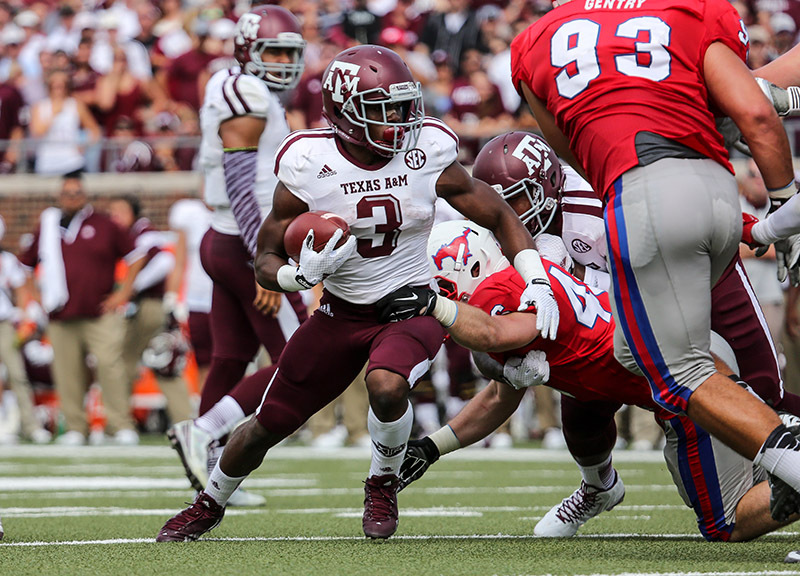 Texas A&M running back Trey Williams (3) runs toward the sideline to score his first touchdown of the afternoon. Texas A&M defensive lineman Alonzo Williams (83) drags down SMU running back K.C. Nlemchi (25) for a loss. 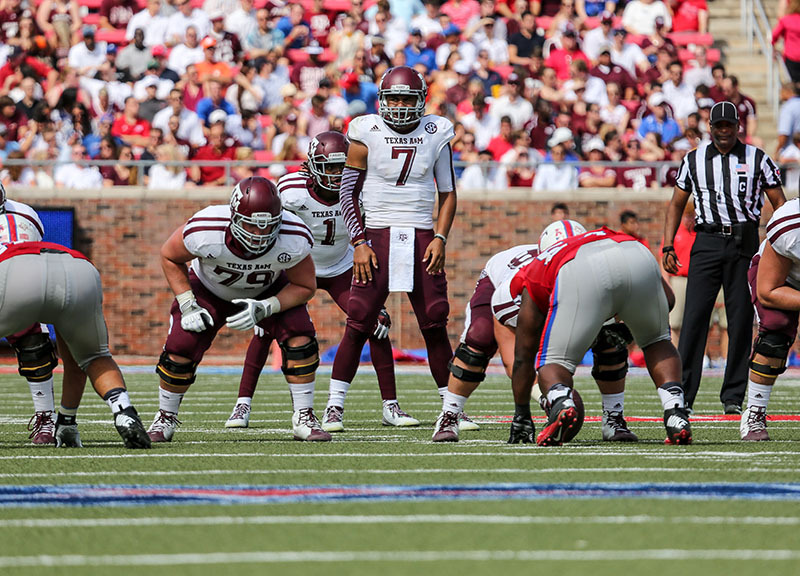 Texas A&M quarterback Kenny Hill (7) surveys the SMU defense in the first half. 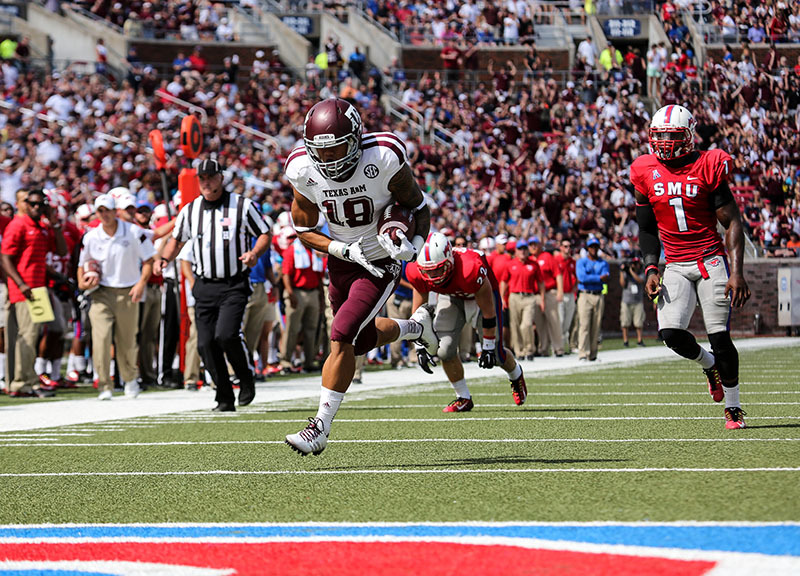 Texas A&M wide receiver Jeremy Tabuyo (19) breaks away from the SMU defense in the first quarter. 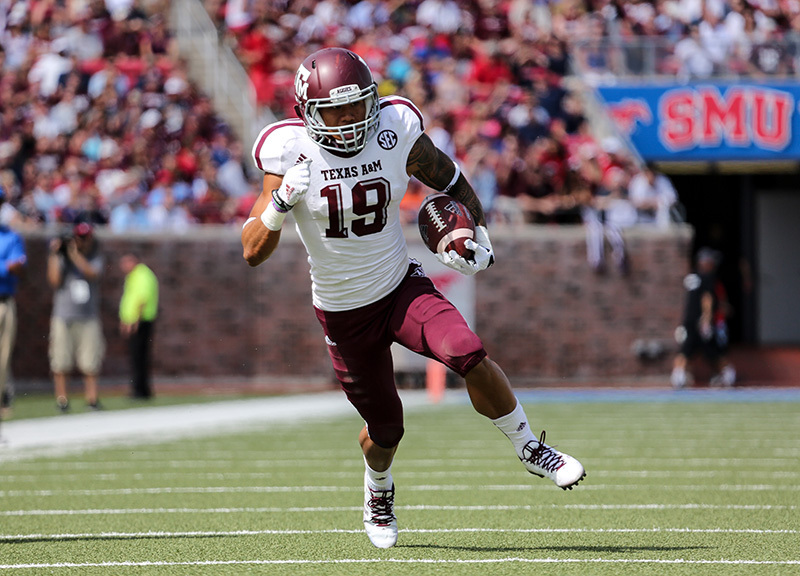 Texas A&M wide receiver Jeremy Tabuyo (19) crosses the goal line for a 30-yard touchdown reception. 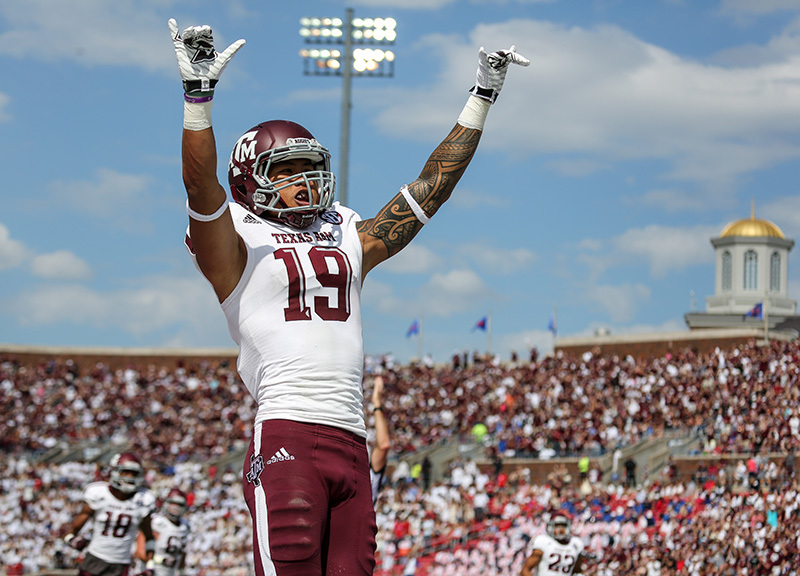 Texas A&M wide receiver Jeremy Tabuyo (19) celebrates after catching a 30-yard touchdown pass. Tabuyo had two catches for 80 yards and two touchdowns. 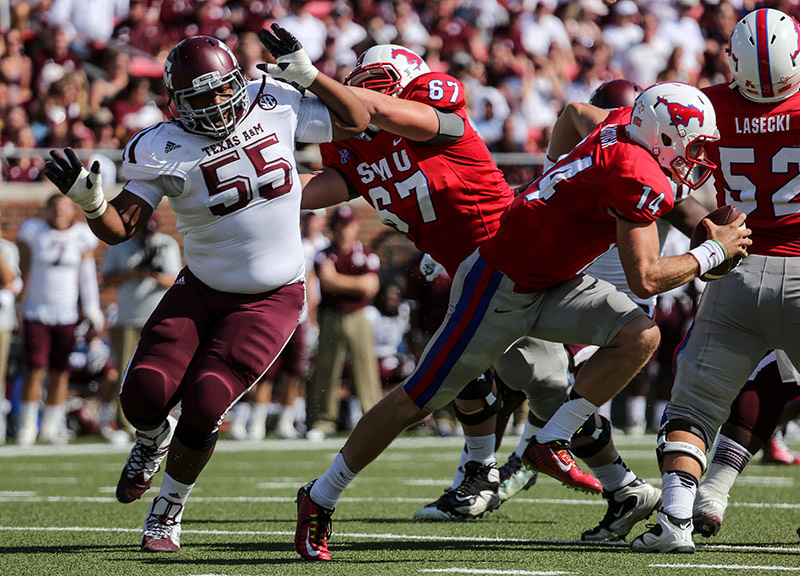 SMU quarterback Garrett Krstich (14) scrambles away from Texas A&M defensive lineman Justin Manning (55). 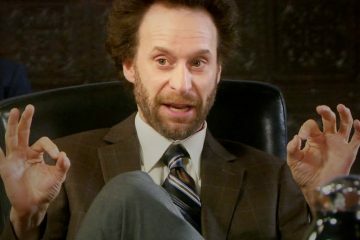 Krstich was sacked five times. 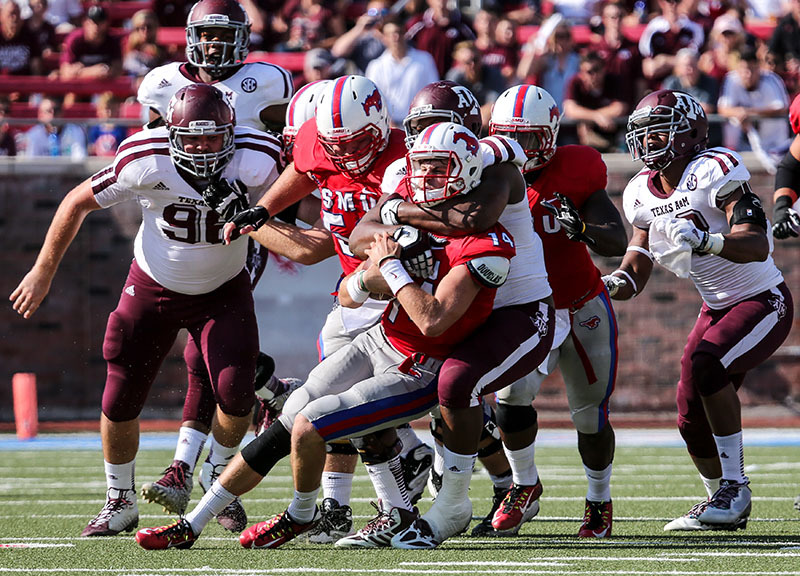 SMU quarterback Garrett Krstich (14) is wrapped up by Texas A&M defensive lineman Alonzo Williams (83). 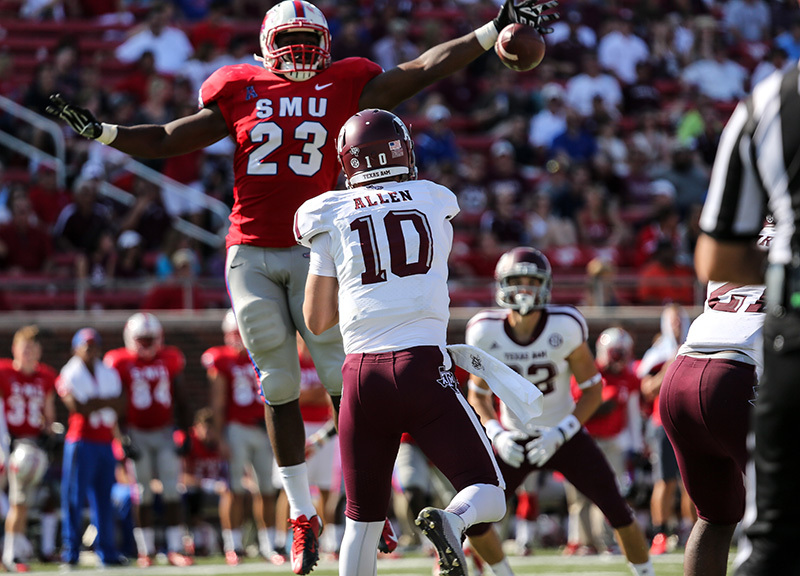 SMU linebacker Stephon Sanders (23) knocks down Texas A&m quarterback Kyle Allen's (10) throw. 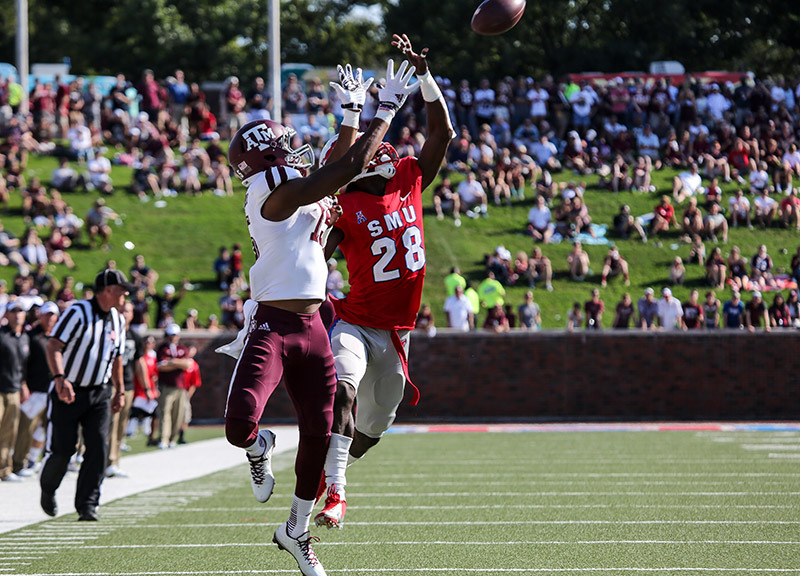 SMU defensive back Shakiel Randolph (28) breaks up a pass to Texas A&M wide receiver Frank Iheanacho. Randolph recorded his first interception of the season in the first half. 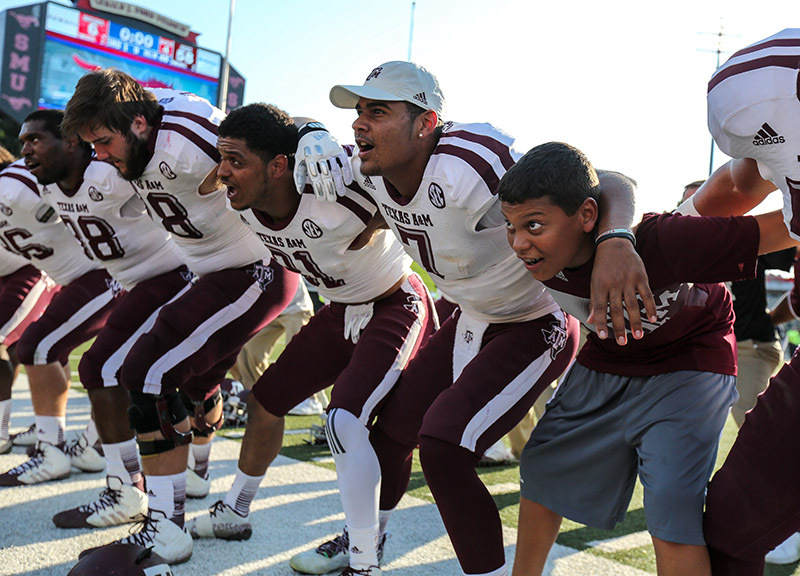 Texas A&M quarterback Kenny Hill (7) celebrates with his teammates after his team's 58-6 victory over SMU. 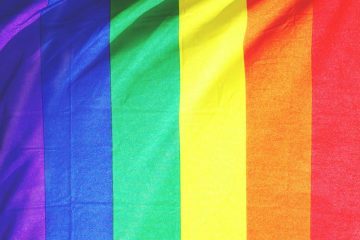 Next ArticleThings To Do on Tuesday, September 23.